Swami Ramdev Ji is a revered saint and a preacher from India. He has created a yoga revolution by teaching pranayama, an ancient art of breathing exercises, and one of the important branches of yoga. While studying India’s ancient scriptures, Swami Ji realized that the science of yoga, a body of knowledge Rishi Patanjali compiled more than a thousand years ago to integrate the mind and the body into a harmonious whole, needed to be more widely given out in its true form. Swami Ramdevji realized that yoga could indeed lead mankind on to the path of positive thinking and good health, the birthright of every human being. Mental and physical health continues to deteriorate throughout the world. Poor lifestyles, including lack of exercise, bad eating habits and addictions have led to such epidemics as obesity, diabetes, high cholesterol, hypertension and cardiovascular disease, among others. Swami Ramdevji believes these conditions can not only be controlled, but in many cases even cured, through the regular practice of pranayama and yogasanas. With that in mind, Swamiji put together a sequence of pranayamas and asanas that can be made a part of one’s daily routine. For years now, Swami Ramdevji has been tirelessly spreading this knowledge all over the world through training camps. Millions of people have benefited from the camps. 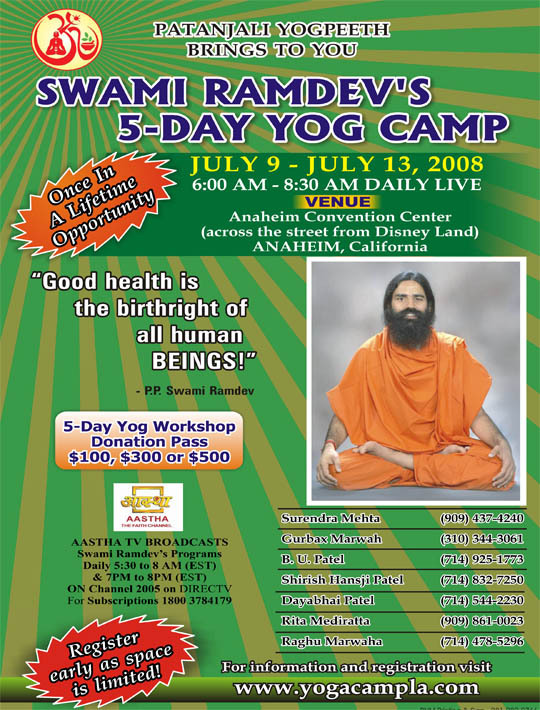 For the first time ever, California is going to be the venue of one such camp Swami Ramdevji will be leading in person. The 5-day camp in Anaheim, Los Angeles, from July 9th to 13th, is expected to draw more than 2,000 people. The yoga session will be held every morning from 6 to 8:30 and people will be able to go back to their work after getting the energy dose from the yoga sessions. Admission passes for the five days are $100, $300 and $500. Sponsorships are also welcome. Thank you for your co-operation in promoting healthy living and looking forward to your participation. Disclaimer : This if for just general information about the event. Dr. Sunit Gupta is neither endorsing nor accepting any liability for this announcement. 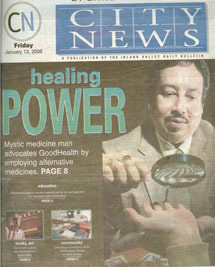 In Need of a Psychic Consultation?